Who else is ready to #Go4thDTLA? Food, music, fireworks: the best things about any Fourth of July block party! If you’re looking for a family-friendly place to enjoy all of those things for free, Grand Park’s Fourth of July Block Party is it. Doors open at 3 p.m.; the fireworks show is set for 9 p.m.
And the easiest way to get to the block party? With Metro! Pro-tip: Avoid long lines at the TVMs after the event by loading your TAP card with cash fare/day pass before starting your trip. 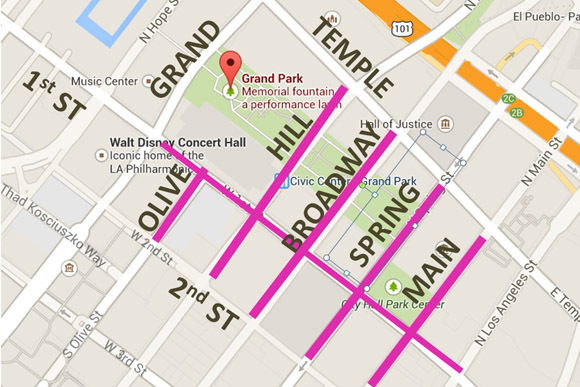 Take the Red/Purple Line to Civic Center/Grand Park Station and use the 1st Street exit. Temple Street exit will only be open for ADA/elevator access. If you don’t mind a short walk, you can also hop off at the Gold Line Little Tokyo/Arts District Station and walk towards City Hall. For those wishing to arrive at the block party on two wheels, LACBC will be offering free Bike Valet on 2nd and Hill! For more route options, use Trip Planner. Finally, check out the map below to see the street closures in the area on July 4th.